Shivalayaottam is a unique ritual held to 12 Shiva Temples located in Kannyakumari District in Tamil Nadu on Shivratri day. 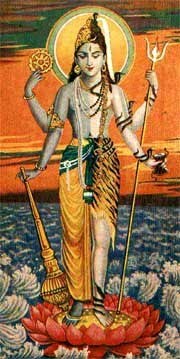 The unique aspect of the Shivalayaottam is that those participating in the running chant Govinda Govinda – Vishnu Nama. Performing Shivalayaottam is considered highly meritorious. The visit to the twelve temples should be completed on the Shivratri day. The 12 temples are located in Kalkulam and Vilavankodu Taluka in Kannyakumari District. The twelve temples are Tirumala, Tikurichi, Triparappu, Tirunandikara, Ponmana, Pannipakam, Kalkulam, Melamkodu, Tiruvidaykodu, Tiruvithamkodu, Tripannikadu and Tirunattalam. The running to 12 Shiva Temple is associated with Pandavas, Sri Krishna and the Mahabharata. Legend has it that Krishna wanted to invite Vyakrapada Muni as chief priest for the Ashwameda Yaga conducted by Pandavas after the Mahabharata war. However, Vyakrapada Muni was a Shiva devotee and he had anger towards Vishnu. Sri Krishna also wanted to alleviate this hatred – which was ignorance. Krishna asked Bhima to invite Vyakrapada Muni for the yajna. Krishna also gave 12 Rudraksha to Sri Krishna and a piece of advice. Bhima approached the Muni who was meditating at a spot named Munimarthottam. As advised by Sri Krishna, to garner the attention of the Muni, Bhima called out Gopala, Gopala. The muni who was a Shiva Bhakta was angry with someone disturbing his meditation with a Vishnu chant. The Muni dashed towards Bhima and fearing the curse of the Muni, Bhima started running. When Muni was about to catch Bhima, he dropped a Rudraksha as directed by Sri Krishna. Immediately a Shivling came up there. The Muni shed his anger and started offering worship to the Shivling. When the Muni completed his worship, Bhima approached him again chanting Govinda, Govinda... The Muni got angry again and started chasing Bhima again. When the Muni was about to catch Bhima, he dropped another Rudraksha and a Shivling came up there. The Muni again performed puja. This running and dropping of Rudraksha continued for another nine times. Finally, the place where the 12th rudraksha was dropped Sri Krishna appeared as Vishnu before Bhima and as Shiva before Vyakrapada Muni. The spot where Sri Krishna appeared a temple was built and the deity worshipped here is Sankaranarayana. Sri Krishna was thus able to convince Vyakrapada Muni that Shiva and Vishnu are One. Vyakrapada Muni agreed to participate in the Ashwameda yaga. Shivalayaottam is performed in memory of the running performed by Bhima. The temples in the Shivalayaottam are at those places where Bhima dropped the Rudraksha.